When I finished the five contenders, my instinct told me that the marten was too cute and my badger-drawing skills weren’t quite up to snuff (although badgers are so fun when they are full on angry). I was happier with the other three drawings. I leaned against the boar, because he looks too kindly to me to be Carl (although I hope to be able to use him in another role), leaving the fox and the hare as the two best candidates and a strong temptation to use the hare because the pun is just so good. I think both have a certain gravity to them, and a certain haughtiness that I like for this. I thought it would be helpful to get some outside perspective so before making a final decision, I put all five options out there, and while there has been some love for the fox, the overwhelming majority of feedback I have gotten has been in favor of the hare. It seems I am not the only one who can’t resist a good pun. The pun was not the only factor though. I have experience with rabbits. I have cared for rabbits and are familiar with the way they look and move in a way I am not with foxes. I know their personalities, and the many ways their faces show disdain. Also, commenter Hilary astutely pointed out that there is a tradition of wise and even strategically brilliant rabbits in literature and popular culture, citing as examples Hazel and Fiver from Watership Down, Bre’r Rabbit in the Uncle Remus stories, and Beatrix Potter’s Peter Rabbit. I think the latter two are more crafty than wise, but the former two are rabbits of true vision. Hazel jumped to mind immediately when Lauren suggested a hare. 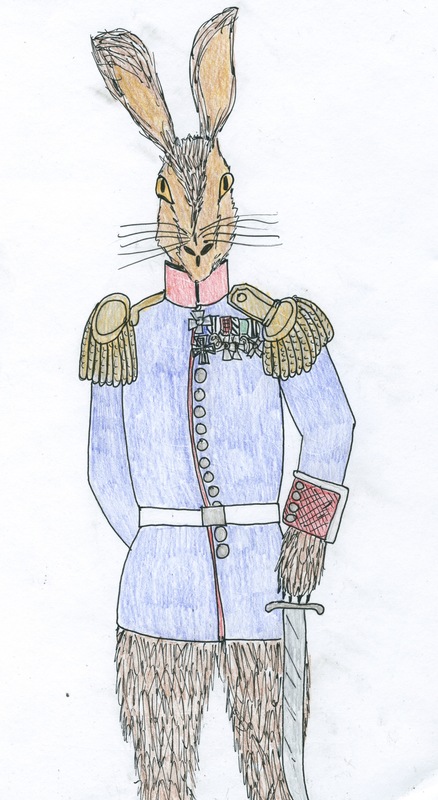 The point is, not only is Hare Clausewitz an awesome pun, but my experience with rabbits could give me more range and ease when it comes to the illustrations with less reliance on photos, and this hare will be in good company in the pantheon of literary rabbits. As an extra, unrelated tidbit, I have another experimental hedgehog for you, this one smartly executing that ditch-crossing in one bold move. He is one of my ongoing collage trials, of which I will try a few more before giving them up, so you may see some more of those. Within the next week or two, I expect to have some lettering, a print or two, and the first post regarding the text, as I’m starting to get a real idea of what that might look like. Finally, I was going to post something about the National Military Strategy (which was released last week), but (and I think maybe I am starting to sound like I’m campaigning for President of the Ink Spots fan club since I feel like I’m mentioning them in every post, and honestly, I haven’t even decided if I’m running yet) you should probably just go read Gulliver’s piece on it from the other day. He said pretty much everything I was thinking (mainly that it was unsurprisingly but disappointingly vague and empty) with the added twist of comparing it against the requirements of the actual law mandating its creation. I won’t say I expected much more than the ‘we will be ready to face the challenges that are in front of us’ type of statements that were in there, and I am sure that our nation’s top military minds have something better at their command than the kind of uselessly broad and strategically empty material put forth in this document. At least, I sure as heck hope they do, because we can’t afford for this to be the best they have to offer. And we can’t afford for the civilians in the Legislative and Executive Branches who have a say in national security not to know enough to expect better. A. Thanks for the shout-out. 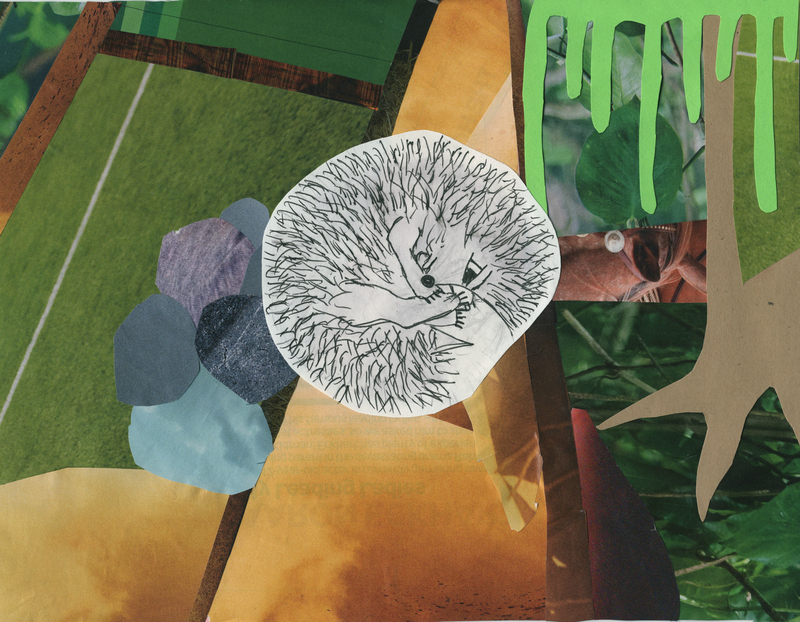 B. I can’t even conceive of the amount of work that goes into something like this, but the hedgehog collage sort of makes my head spin with its multidimensional two-dimensionality. Haha. But makes your head spin in a good way? Or a bad way? Crucial difference. I think Gulliver has created a whole new branch of physics with the way his head is spinning from multidimensionality. Man, these kids today! Up until all hours of the night with their quantum physics and their M-theories! The hare is good, for all of the reasons you mentioned, but also because the hare is quick, agile and flexible. If anyone has ever chased a hare, they no that they almost anticipate your every move and react in a split second. That seems to speak to Clausewitz in a unique way, after all, a large part of is prescriptions have to do with speed. This distinguishes the hare from the boars and badgers, who, perhaps, seem more traditionally martial, but whose attributes do not link with Clausewitz’s. That being said, I do not like those collages. They are visually tiring and, at least for me, utterly incomprehensible. I do not wish to offend, but I neither think them attractive or effective as mediums of communication.